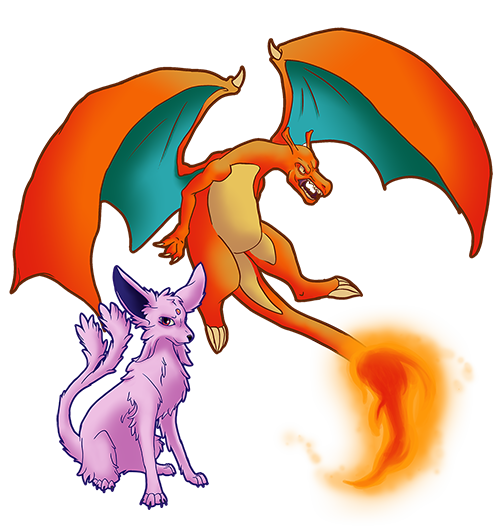 Mathias is a kind Charizard with a heart of gold, though he sometimes looks angry. He at first was ignorant of the world until the outbreak began since then he's been more considering on helping others survive in the world, but at the same time keeping himself alive. An interesting thing with Mathias is that he enjoys the company of others. He sometimes acts a bit funny when talking with others. However, combat wise, he faces danger head on and willing to keep anything away from his fellow team mates. He has a scar from a knife being hurled from an explosion, between his eyes during a fight against the smaller undead. Mathias' Adventure began 25 years ago. He was caught as a Charmander by a young militant recruit by the name of Zeke. Having no love for his trainer Mathias often got into trouble by scratching everything in sight. However, his trainer didn't give up. He gave Mathias some of his food when they went places. Eventually, Mathias began to love his trainer and then began to battle the first 5 gyms, but never made it to the 6th gym. Zeke retired from training and Mathias had stayed by his side for the 22 years he's been with him. Until the day came where Zeke's unit had been called into service. Mathias stayed behind hoping Zeke wouldn't get killed. After 2 years Mathias and Zeke were reunited for only a year, then it happened. Zeke was called back to duty once again but this time he wouldn't be coming back. 3 months later, the outbreak began and turned Mathias' life to that of a nightmare. Mathias however had been running from the undead and doing what he could to survive, until he had came to an old camp ground with a propane tank still full on fuel. Mathias used his flamethrower attack to ignite the tank however the explosion hurled a knife leaving a cut between his eyes. Since then he continues to fight to survive in this new world of survival horror. What is known to him is that he'll use anything in the environment to help decrease the undead in numbers though often he misses and has a hard time knowing how to take one out from a distance. He seeks the truth about his destiny and find a way to help those in need over his own. He believes there are some undead out there that aren't insane. -Mathias witnessed several Pokemon being killed before his eyes. 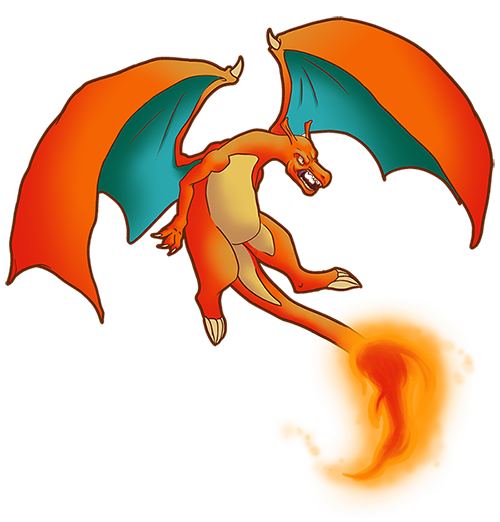 -Despite his characteristics he's actually a nice Charizard with a heart of gold. -He is a quick learner and often finds things that might help shed some light on the viral outbreak. -Often mixes his attacks to create additional damage to enemies. -He's not the greatest at long range attacks making him more ideal with medium to close range. Bastet often uses her psychic powers to read the minds of her friends and foes, especially Mathias, since she sees him as a big brother She's kind and very respectful to those she meets. Bastet believes there is a latent power in her that she has yet to draw out. 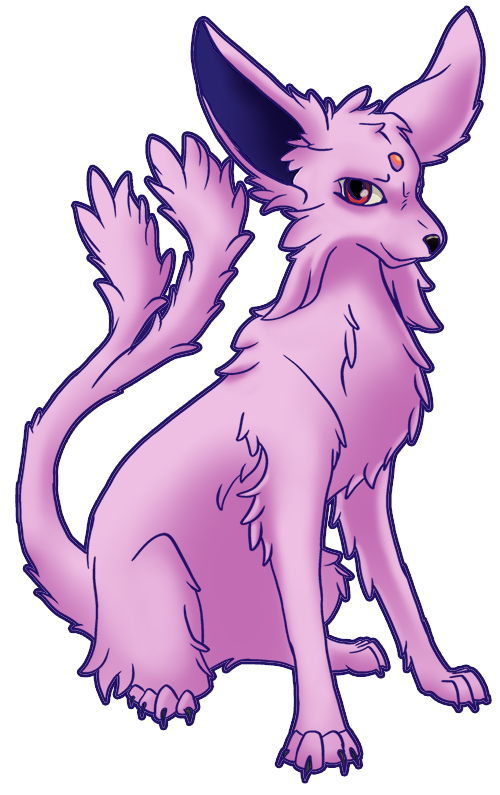 A normal Espeon that believes she has a latent power in her. Bastet started out as a gift to Zeke when she was a young eevee. When she first met Mathias she viewed him as a big brother she never had. She often played with him and had fun during their travels, but she never left Zeke's side. As they trained through the Kanto region, Bastet often was chosen to be partnered with Mathias in some battles. While fighting with some of team rocket's goons, she had always seemed focused and when Mathias attacked so did she. As she grew up, Bastet found herself training near a dawn shard and after fighting against so many wild pokemon, she found herself evolving. Light enveloped her and when the light faded she was no longer an eevee. Mathias was happy she evolved and with her new found powers she tested it out on her trainer. His thoughts was happy for her and she also read Mathias' mind. She couldn't be happier with them being glad for her. They traveled together to Saffron City to the department store for some supplies and when they finished they went all the way to Pallet Town to rest at home. Then Zeke had to go on a mission and he took Bastet with him to the Orre region. His squad was ordered to investigate the area due to cannibalism of other pokemon and civilians. Bastet was worried about Mathias, if he'll be okay on his own back home. Suddenly the outbreak began and for the amount of years she was with Mathias and Zeke she was scared for the first time. She feared that Mathias could be in trouble and is needing her help. For as long as she stayed with Zeke she protected him against the undead, but he released his other pokemon to help out they all got infected except for Bastet which was told to run by Zeke as the undead overtook them. She ran as far away as she could and kept a link to Zeke's mind until the very end his last words to her was find Mathias and before he could finish his dying thought was cut off from her. She was alone and worried about Mathias. Bastet now stuck on Orre searches for a way to find the charizard and reunite with him. -Uses psychic abilities to communicate with her friends. -Believes she has a latent power brewing in her that she has yet to find. -Given as a gift to her trainer.